Triclabendazole, sold under the brand name Egaten among others, is a medication used to treat liver flukes, specifically fascioliasisand paragonimiasis. It is very effective for both conditions. Treatment in hospital may be required. It is taken by mouth with typically one or two doses being required. Side effects are generally few, but can include abdominal pain and headaches. Biliary colic may occur due to dying worms. While no harms have been found with use during pregnancy, triclabendazole has not been well studied in this population. It is a member of the benzimidazole family of medications for worms. Triclabendazole was approved for medical use in the United States in 2019. It is on the World Health Organization’s List of Essential Medicines, the most effective and safe medicines needed in a health system. For human use it can also be obtained from the World Health Organization. It is also used in other animals. It is a member of the benzimidazole family of anthelmintics. The benzimidazole drugs share a common molecular structure, triclabendazole being the exception in having a chlorinated benzene ring but no carbamate group. Benzimidazoles such as triclabendazole are generally accepted to bind to beta-tubulin therefore preventing the polymerization of microtubules. Since late 1990s, triclabendazole became available as a generic drug, as patents expired in many countries. Many products were developed then. Among them, Trivantel 15, a 15% triclabendazole suspension, was launched by Agrovet Market Animal Health in the early 2000s. In 2009, the first triclabendazole injectable solution (combined with ivermectin) was developed and launched, also by Agrovet Market Animal Health. The product, Fasiject Plus, a triclabendazole 36% and ivermectin 0.6% solution, is designed to treat infections by Fasciola hepatica (both immature and adult liver flukes), roundworms and ectoparasites, as well. Fasinex is a brandname for veterinary use while Egaten is a brandname for human use. is a halogenated benzimidazole compound that possesses high activity against immature and adult stages of the liver fluke, Faciola hepatica. The intensive use of Triclabendazole in endemic areas of facioliasis has resulted in the development of liver flukes resistant to this compound. 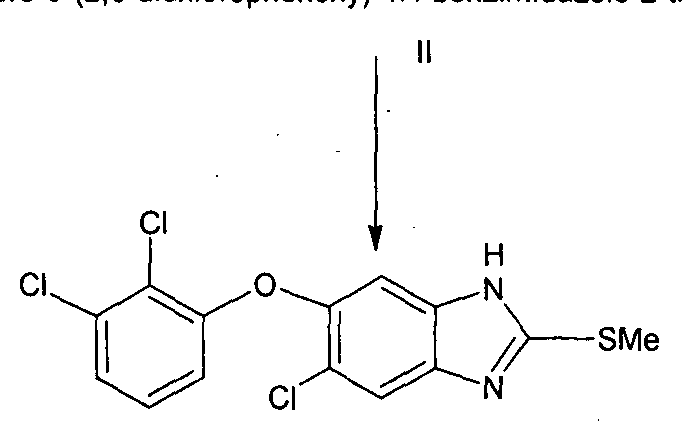 US 4, 197,307 discloses the process for the preparation of Triclabendazole, wherein 4- chloro-5-(2,3-dichlorophenoxy)-l,2-benzenediamine is reacted with carbondisulfide to give cyclic benzimidazole thione, which is further subjected to alkylation reaction with dimethyl sulfate to give Triclabendazole. 2, 3-dichIorophenol (1 kg) in DMF (1.5 L), 2-nitro 4,5-dichloroacetanilide (1.52 kg), and potassium carbonate were heated into the flask for 12 hrs while maintaining the temperature at 90°C under vacuum and after that cooled to room temperature. Methanol (2 L), 48% caustic lye (0.3 kg) in 300 mL water were added to it and heated to 50°C for 4 hrs. Further water (4 L) was added, stirred, filtered and washed with water and with methanol. 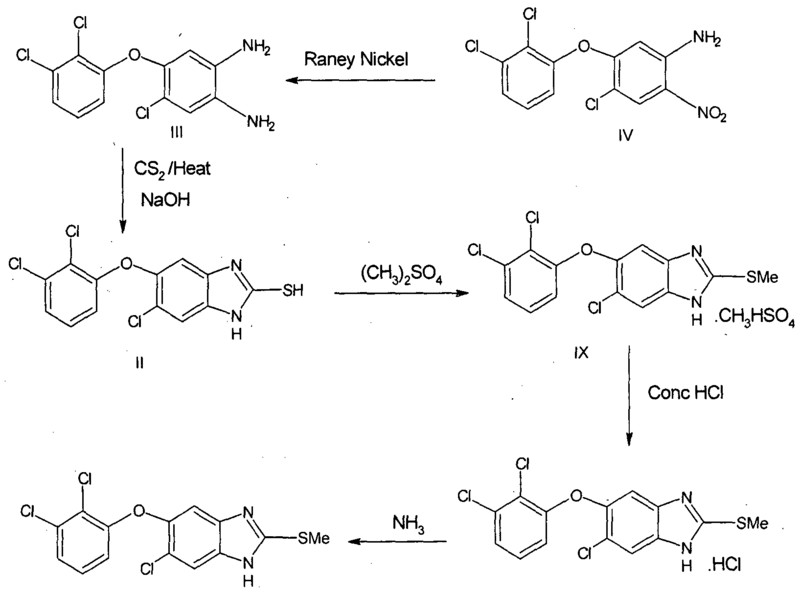 Raney nickel (10.8 g) was added into a reaction mixture containing 4-chIoro- 5(2,3-dichlorophenoxy)-2-nitroaniline (900 g), methanol (3.4 L) at RT, caustic lye (2.72 g). Nitrogen was flushed into and charged with hydrogen. The reaction mixture was heated slowly to 100°C for 12 hrs, cooled to RT and filtered. In the mixture of 4-chloro-5(2,3-dichlorophenoxy)-l ,2-phenylenediamine in methanol (800 g) and caustic lye (245 mL), carbondisulfide (259 g) was added slowly and the reaction mass was refluxed‘ for 6 hrs. After completion of the reaction water (2.5 L) and acetic acid was added over a period of 2hrs at 60°C. Water was added (2.5 litre) again and heated to 90°C for 2hrs, filtered and washed with hot water to obtain the title compound. 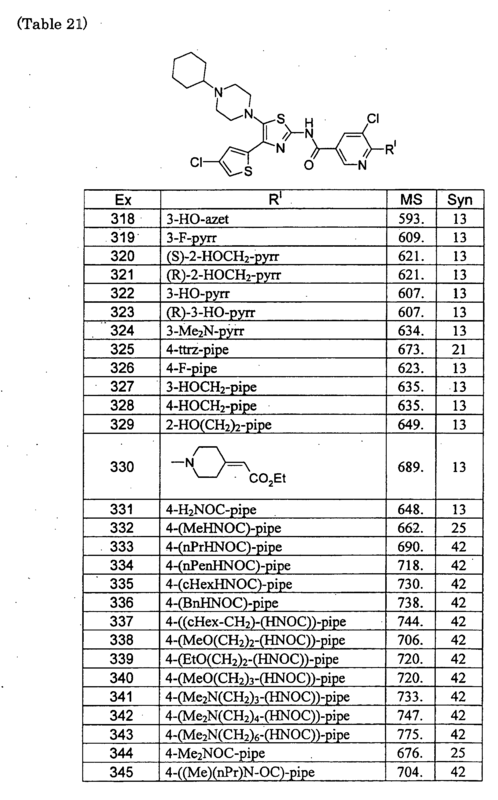 6-chloro-5(2,3-dichlorophenoxy)-l H- benzimidazole-2-thiol(400kg) was added to methanol (700 L) and heated to 40°C. Dimethyl sulphate was added slowly at 40°C to it. The reaction mass was heated to 60-65°C and maintain for 6hrs. After completion of the reaction the reaction mass was cooled to 15°C, centrifuged the material and washed with 75 L of methanol to obtain wet cake of Triclabendazole methanesulfonate (520-560 kg). Triclabendazole methanesulfonate (200 g) and methanol (1.2 L) was refluxed, cooled and charcoal was added and refluxed again for 1 hr. The reaction mass was filtered and concentrated hydrochloric acid was added. The precipitate was‘ cooled to RT, stirred for 1 hr, filtered and Triclabendazole hydrochloride was isolated (250 g wet) . The water was added to the above Triclabendazole hydrochloride and ammonia was charged and stired for 2-3 hrs. The reaction mass was filtered, washed with water and dried to obtain Triclabendazole. Example 2:Preparation of 6-chloro-5(2,3-dichlorophenoxy)-2-(metylthio)-lH- benzimidazole In a RBF methanol (200 mL), 6-chloro-5(2,3-dichlorophenoxy)-lH- benzimidazole-2-thiol ((200 g) and dimethylsulfate (40 g) were heated to 60 ± 2°C and water (100 mL) was added and stirred for half an hr. Sodium carbonate solution (25 g Na2CC>3 in 200 mL water) was added slowly and temperature was raised to 60 °C and stirred for VA hr. After completion of reaction, the reaction mixture was cooled to 60°C, filtered, washed with water further washed with toluene and dried. To the above wet crude 6-chloro-5(2,3-dichlorophenoxy)-2-(metylthio)-lH- benzimidazole, toluene (500 mL) was charged and water was removed azeotropically using Dean Stark apparatus. The mixture was heated to 100-1 12°C and 5 g charcoal was added, stirred for half an hr at 100-105°C. The reaction mixture was filtered through hyflow bed and washed with fresh toluene. The mother liquor was cooled to 70°C and isopropanol (7 mL) was added, cooled to room temperature to precipitate, filtered and washed with fresh toluene, dried at 75°C for 4 hrs to obtain pure Triclabendazole. Yield of Triclabendazole is 85 gm. (81.7%). The wet cake of Triclabendazole was heated to 90-100°C in toluene (1.92 litre). Water was removed azeotropically. The solution/mixture was cooled charcoal was added, refluxed and filtered. Again the obtained material was heated to 90-100°C, 180 ml of IPA was added, cooled to RT, filtered and dried for 24 hrs at 90-100°C. The first gas _ ■ 5- obtained in step -6_ (2,3- _ ■ gas phenoxy) _2- mercapto – benzo taste Jie sit 47.5kg, oxygen potassium 8.5kg, a concentration of 80% 285kg of methanol, added to the reaction kettle was cooled to ice bath 5~10 ° C, was added dropwise dimethyl sulfate 19kg, 3 hours dropwise, stirring continued for 3 hours to obtain a reaction solution containing triclabendazole, the conditions of room temperature under added dropwise to the reaction solution containing triclabendazole in dilute sulfuric acid to adjust the pH 8-9, 50kg of purified water was added dropwise, dropwise 2 hours, stirring was continued for 2 hours at the same temperature, as a large amount of white solid precipitated a thick paste; 80kg of deionized water was added, stirred sufficiently dispersing the paste solids, filtered off with suction, washed to neutrality with 80kg purified water immersion, drying centrifuge, drying, to give a crude product triclabendazole 42kg, close was 81.5% with a purity of 95%, recrystallized from ethanol to give the desired product triclabendazole 39kg, yield 92.8%, content 99.5%, of which 5-chloro-6- (2,3-dichloro phenoxy) _2_ mercapto – benzimidazole compound of the formula V in the reaction; triclabendazole a compound of formula VI in the reaction. ^ Jump up to:a b c d e f WHO Model Formulary 2008 (PDF). World Health Organization. 2009. pp. 94, 96. ISBN 9789241547659. Archived (PDF) from the original on 13 December 2016. Retrieved 8 December 2016. ^ Jump up to:a b c Wolfe, M. Michael; Lowe, Robert C. (2014). “Benzimidazoles”. Pocket Guide to GastrointestinaI Drugs. John Wiley & Sons. p. PT173. ISBN 9781118481554. Archived from the original on 2016-12-20. 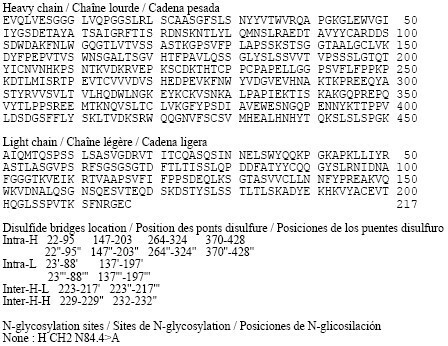 ^ “Egaten (triclabendazole)” (PDF). FDA. Retrieved 18 February 2019. ^ “Triclabendazole – Drugs.com”. http://www.drugs.com. Archived from the original on 20 December 2016. Retrieved 10 December 2016. “Report of the WHO Informal Meeting on use of triclabendazole in fascioliasis control” (PDF). who.int. 2006. Retrieved 10 December 2016. By DR ANTHONY MELVIN CRASTO Ph.D in FDA 2019 on March 18, 2019 .